Headscan has always been a definitve milestone in intelligent dance electro, industrial techno, cyberpunk, call it what you will, in a pantheon of names like Haujobb, Clock DVA or Forma Tadre. 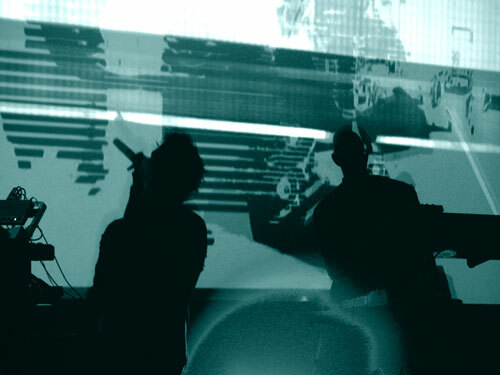 Cool, blue and sombre across the soundscape of the real, they slapped Gibson and Sterling into the mix of hyperclear electronics under the TV skies of Canada. Taking a break, they shared their opinions on cyberpunk, bizarro, techno-fetishism, Dune and many more. Let’s talk first about PATTERN RECOGNITION, your latest LP. The title – is it an homage to the latest novel of seminal visionary William Gibson, a reflection on Kurzweil’s theories, both or none? I tend to notice elements of Lassigue Bendthaus, Clock DVA or Index AI in your music. How inspiring were their albums for you and what key motivating artistic forces can you name listed behind Pattern Recognition? CLAUDE: The albums of Lassigue Bendthaus where greatly inspiring, especially when it comes to the sound manipulation ideas that it brought forth, digital sound cut ups and time-stretching where new to me at the time. The themes that Clock DVA explored where an inspiration, the album Man Amplified easily comes to mind. The Index project was never a source for inspiration but it seems we share similar interest. We’re greatly fascinated and inspired by architecture, design, music, philosophy, history, psychology and technology. The main concepts we explore include aspects of abstraction, analogy, civilization, culture, entropy, knowledge, mystery, patterns, structure and transformation. Our musical influences cover a very wide range of styles and periods in time, and are definitively not limited to industrial or techno even if that is Headscan’s primary milieu. We decided to format the band’s musical ideas and interest into an aesthetic that is dark and futuristic but we bring sounds to the mix that come from other fields of reference. For example, the piece Terra Incognita as Polynesian seashell horns alongside synthesiser pads and the song Sentinel makes good use of mideastern frame drums to support a driving electro beat. It’s blending together what we’ve learned from contemporary and past musical experience that makes its really interesting for us. We focus on what really touches us as individuals and artists, our intention is to create personal musical hybrids, based on our shared personal experience and the vision we have for a particular project. Synchrony and Slipstream Monocraft are very “zonerunnerish” tracks – completely changing states of mind, putting minds to zen ease, bringing a strong but gentle flow to the mind. Can you tell us how these compositions were born? 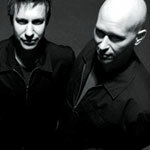 CLAUDE: As much as Headscan’s music is cold and technologic on the surface, it’s really emotions deep down that drive our songs. Our music and lyrics are about self-knowing, the recognition of our essential nature, its essence in the experience. It’s all about looking down on life until you see it as it really is, free from illusions; it is a mental divestment of our self until we recognize our true nature, acknowledge our emotions, lay negativity to rest, and answer fundamental questions about our own being, and about life and death. It’s recognition of the inter-relatedness of everything that we are and do. Your 2001 album “Shaper and Mechanist” refers to cyberpunk novelist Bruce Sterling’s Shaper/Mechanist universe, a space opera covering around 350 years of future history. How inspiring was that universe during the time of the LP and how come you chose this title? CLAUDE: The work of Bruce Sterling is very inspiring, it creates very strong visual mental images that transported me while writing music for our first record. It sometimes was like writing music for a film only played in my head. The need to share these visions manifested itself via the bands musical work. The stories comprised in that universe and others that Sterling wrote deal with posthuman society and the post-humanist philosophy. In his view of the future, humanity has largely polarized into competing factions, the Shapers are “organic” oriented and push the limits by manipulating the human body itself, through genetic modification and highly specialized psychological training. In contrast, the Mechanists use cybernetic augmentation, advanced computer software, technical expertise, and drugs to achieve their goals. There was also the theme of the commodification of Humanity that mirrors the philosophy of many modern corporations, both Shapers and Mechanists often treat individuals as if they were technology and tools to dispense when done with. There is a continual tension between people attempting to express their individuality and human feelings, and the political, economic and technological forces that compel them to suppress their humanity. One idea behind the concept of our first album was to explore the duality between the organic and the mechanic, and to understand how they can come to cohabit or maybe simply merge together, it is all about understanding a modern definition of life that includes both these perspective on life. In Sterling’s stories we see how both factions compete in an uneasy duality and we wanted to explore the possibilities of them combined instead, hence the title Shaper AND Mechanist. We’re simply very fascinated by the evolution of philosophies and ideologies that occurs in human history. Shapers take the organic path with gene splicing and psychological traning, whereas Mechanists go the other way round with techno-fetishism, softwares, tech expertise and drug use. Whose side would you take and why? CLAUDE: The prospect of integration between man and machine is fascinating. Since the early times, man has noted with awe the many parallels existing between organisms biological organization and that of machines. In fact, for centuries we have been bestowing to our creations many of the abilities and functions of human beings. Shovels are extensions of our arms, cranes are fingers to grab heavy objects, water pipes are similar to our system of veins and arteries, telescopes increase our eye power; and, nowadays, the internal wiring in computers is almost as complex as our nervous system. By bestowing intelligence to machines, man will eventually be able to acquire many benefits for his health, as well as to increase his own intellectual capabilities, such as memory. The limit of this symbiotic process is unforeseeable and need’s to be acknowledge if it is to serve the better good of man. The Shaper/Mechanist parties parallel with the Bene Gesserit and House Tleilax/IX of Frank Herbert’s Dune universe. How do you conceive of its world and philosophy? CLAUDE: As in Sterling’s vision of the future, political themes in the Dune series include human beings’ susceptibility to mass manipulation by political propaganda, religious dogma, and the importance of self-awareness and self-mastery in resisting these types of control, as well as the study of power and control. Herbert innovated in one major way: in his day, Science Fiction was seen mostly as a way to express mind-expanding ideas through story, but the idea was the star, and the story itself was mostly seen as a “coat hanger” for the idea to hang on. Characters in Science Fiction were typically flat, plots were contrived and dialogue stilted and unrealistic. Herbert drew on his extensive self-education to marry Science Fiction with some of the strongest elements from Literature, History, Mythology, Eastern Religions, Mathematics, Science and his personal life. Dune presents us with a self-contained world, complete with its own races, religions, politics, and geography. Herbert introduces this new world and then adds a fascinating and intricate story, with vivid characters and scenes bolstered by an underlying ecological message. Dune has become the central masterpiece of Science Fiction, just as The Lord of the Rings is to the genre of modern fantasy. Although the intensity of the Cheap Truth and early 90’s cyberpunk died with entering into social and techno-ethical grounds and also, geekdom, a similar, yet lot less comprehensible intensity is noticeable in the works of Kenji Siratori, Carlton Mellick III and similar so-called Bizarro artists. How much do you consider them cyberpunk and what would you really call “cyber” nowadays – it being any kind of art? CLAUDE: Asking someone to define Cyberpunk is like asking someone to define art. Each person has their own ideas about what art is, what constitutes art and what doesn’t. Yet we all still know art when we see it. The same is true for Cyberpunk – each cyberpunk has their own definition for it, yet common threads remain. In basic terms, these might be defined by an emphasis on individualism and technology. Popular culture has included the concept as a movement and also as a fashion trend associated especially with the rave/techno subculture. Cyberpunk literature is often used as a metaphor for the present day-worries about the failings of corporations, corruption in governments, alienation and surveillance technology. Cyberpunk may be intended to disquiet readers and call them to action. It often expresses a sense of rebellion, suggesting that one could describe it as a type of countercultural science fiction, however, many critics arose to challenge its status as a revolutionary movement. Cyberpunk was not a revolution invading SF, but rather just another flavor of SF. The Bizarro artists define themselves through punk fantasy and sacrilegious satire. They explore surreal versions of earth, in current times and imagined futures. The term postcyberpunk could be used to label the works such writers produce. In this view, typical postcyberpunk stories continue the preoccupation with the effects of computers and so forth, but without the assumption of dystopia or the emphasis on cybernetic implants. Like practically all categories discerned within Science Fiction, the boundaries of postcyberpunk are likely to be fluid or ill defined. As experimental literature turns away from a representational aesthetic and philosophy it no longer pretends to offer intelligible mediations of the real, it is the observer himself whose gaze is “destabilized” now that he has been made to see openings in the network of observations and self-observations that constitute the social. Such as you took a giant step forward from Shaper and Mechanist to Pattern Recognition in production and sound quality, a similar step can be construed into your album titles – the first being a more hackerish, teenagerish, energetic product and the second one a laidback, more mature, more philosophical one. What changed inside you between the two albums – personally, musicwise and thinkingwise? CLAUDE: The first album was our introduction to the scene so we made it an upfront and in your face experience. The subject matter was exposed with a certain simplicity but with conviction, attitude and energy. The first cd took most of one year to complete while the second disc took us a very long four years. Our work got valued time and because of this the result turned into a much more profound and focused album. We mainly took the needed time to mature as artists and individuals. Would you actually call Headscan a cyberpunk project? CLAUDE: Not really but what we appreciate within that specific movement is the way it deals with social processes and social transformation, which have already begun in our time and points out their possible consequences. Like in some of our songs, Cyberpunk stories are frequently set in urban areas, with a dark atmosphere and a stark mood. Concepts are presented without explanation, just as new technical developments often are presented to us. A moral ambiguity can also be made out often, as only fighting the system doesn’t make the protagonists of the story automatically heroes. How do you approve of the Japanese cyberpunk movies/animes such as Innocence, Avalon, Gusha no Bindume or Stand Alone Complex? CLAUDE: We do enjoy some of these and we’d specially mention Final Fantasy VII, Last Exile, GITS and the Stand Alone Complex series as some favorites. I guess you guys can be mildly fed up with Bill Leeb’s projects constantly mentioned on the Canada axis. Who do you team up with music wise and what other Canadian fellow musicians would you like to showcase? CLAUDE: We’re good friends with the Fractured guys from Toronto and they remixed our song Lolife with some very cool results. We also frequently associate with local Montreal artists like Alain Thibault, Component and others. Some of the very talented local Montreal acts that we appreciate are the likes of Alice and The Serial Numbers, Dandi Wind and Jordan Dare. What is the Canadian electro-EBM scene life nowadays? 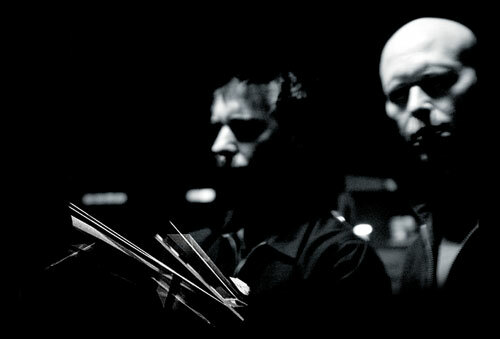 CLAUDE: Canada has a very vibrant EBM, industrial and noise scene with bands like Panacea, Fractured, Decoded Feedback and Urceus Exit. Montreal is home to experimentalist AntZen recording artist Vromb and of Ninja Tune’s Amon Tobin. There are very good music labels including Geska Records, Cyclic Law, .Angle.Rec. and our own ArtOfFact Records. Really worth mentioning is Montreal’s diverse range of electronic arts and music events like the Montreal Electro Groove, Mutek and Elektra festivals. After the electro/techno boom of the 90s, the emphasis from creating new musical genres apparently shifts to decoding countless sub-genres and no real breakthrough like as it was with jungle, drum’n’bass, garage or rave. What comes next? Do you foresee any new musical breakthrough in sound and composition? CLAUDE: The application of Artificial Intelligence techniques in the fields of Art and Music is a significant and captivating research area. There is a growing interest on AI applications in visual arts, music, graphics, video, sound, architecture, design of artifacts, and other creative endeavors. So far, a large amount of the work done in computer music has involved trying to make computers behave like humans. For example, trying to improvise with a robotic partner, and creating music that we’d like to think only humans could make. Composers can use computers to realize their concept of music that is impossible to perform by humans or use them as a tool to develop compositional ideas which would require amounts of calculation unthinkable without the use of a computer. By defining and programming new functions, as opposed to merely imitating functions which humans already perform, one may enhance the composer’s or instrumentalist’s operations in ways previously unheard of, actually expanding the number of abilities at that person’s disposal. This is exciting when you stop and think about how much of what is considered music is based on what humans can physically sense. When such limitations are overcome, the realm of what is considered music may be vastly enlarged. Reinventing genres through constant fusion seems to be a key motif for key musicians. How do you see the electro scene in 2030, how will it sound, feel and smell like? CLAUDE: I’ve really got no exact idea of how music will be like at that time but I easily imagine possibilities that would conjure images of icefloes, frozen wastelands and vertical urban tundras of rectilinear blocks, as though we had entered an ice age of blizzards and freezing fog, the resulting songs would be like cold slates of concrete blured by obscuring mist of chemical processes. The independent label scene seems to be out of flux. There is an unprecendented amount of musicians (lots of them actually talented!) who release their material through MySpace and other community sites or even p2p systems. The labels – on the other hand – are closing their doors before newcomers due to the risk they bring, the amount of money they have to invest in them and all the loss the p2p scene inflicts on them. What do you see, what is a possible way out of this huge globalized playground? CLAUDE: There is no way out, just a way into something new and exciting. The democratization of music creation and distribution is a new reality that is sometimes difficult to assume for any capital oriented individuals or companies. New business models are emerging that already address digital distribution. We also see happening an identity re-evaluation of the physical medium that record companies intend to sell to their customers by making the actual object something worth the financial and emotional investment. The future of the copyright system is another crucial point. As musicians on a major European label, do you see any major change on the event horizon of the copyright mechanism? CLAUDE: We don’t mind that much because the important thing for us is that the ideas we promote and the work that we do is itself made available as much as possible, we’re all about memetic viral spread. Obviously, if fans expect to get more albums produced to the quality of our last one, but no one buys any of the actual records, then labels will cease to invest themselves and their hard earned money in producing, promoting and making the cds available. Other means of distribution and compensation for the artists and partners are being look at as a way to deal with the changing aspects of the music business. We believe we’ll always be able to produce and distribute our work whatever the situation the music market is in. Please tell us about your upcoming releases, there are some eager expectations concerning a possible DVD release and also your first material, “High Orbit Pioneers”..
CLAUDE: Since the release of Pattern Recognition, we’ve been working on a collection of videos, live shots, unreleased an rare songs for a DVD we intend to complete this year. New music is also in the works for a third album and we hope to release specific songs in digital format in the upcoming months. There are some remix on the horizon with one for Unter Null to be released soon. We’ve also got a brand new song called Tomorrow Square that will appear on the Alfa Matrix 5th anniversary special limited CD. What do you guys do when you’re not busy with Headscan, what do you spend your time with, what jobs do you have and how do you kill your stress with? CLAUDE: I enjoy life very much and especially along with my loved one, my child and my friends. I work in the field of telecom and I usually take care of stress by riding my bike, reading books and playing videogames. Christian works as an interactive director in the advertising field. He’s also involved in many club events as a VJ. To de-stress, he rollerblades across the asphalt of Montreal’s streets and also enjoys sipping scotch with friends. What was the most interesting technical innovation in 2006 you became aware of? CLAUDE: There where many new technical innovations already this year and in many fields of technical development but one in particular as some relation to ideas we convey with Headscan. A company by the name of Nantero as proposed the NRAM or Nano Random Access Memory. This memory consists of tiny cylinders of carbon called nanotubes, so called because they are only a few nanometers wide, and have one hundred times the strength of steel. Scientists find them ideal because, unlike other materials, they do not break under repeated stretching that regular memory components endure. This technology could eventually allow vastly greater amounts of data to be stored on computers and mobile devices. Experts estimate that within 20 years, you may be able to fit the content of all the DVDs ever made on your laptop computer or store a digital file containing every conversation you have ever had on a handheld device. This new kind of memory could put a world of data at your fingertips instantly, wherever you go. You embark on a galactic voyage with one CD, one book and one favourite visual art product – what would those be? CLAUDE: Carbon Based Lifeforms’s Artificial Garden, the book that I’m reading at this time which is Perdido Street Station by author China Miéville, and a sculpture by Elaine Fortin. CLAUDE: Thank you very much for having us in your pages, and also thanks to your readers who strive to know more about what’s out there. Cheers to all!